Hyderabad: With the movement for a separate Telangana gathering momentum again, Andhra Pradesh appears to be heading for another round of political uncertainty. Hunger strikes, boycott of examinations, campus unrest and street protests are back as the Srikrishna committee is set to submit its report to the central government. The indefinite hunger strike by Congress MPs from Telangana demanding withdrawal of cases against those who took part in the campaign last year and this year and deployment of central paramilitary forces in Hyderabad and elsewhere to tackle protests have injected a sense of urgency. This, coupled with the rebellion the Congress is facing from loyalists of former MP Y.S. Jaganmohan Reddy, his plans to float a new party and the spate of farmers' suicides triggered by the crisis in agriculture, has pushed the state into an uncertain future. The leadership vacuum created by the death last year of chief minister Y.S. Rajasekhara Reddy was felt throughout 2010, feel political analysts. The Telangana issue has divided the ruling Congress and the main opposition Telugu Desam Party (TDP) vertically and pushed all other issues to the backseat. TDP chief and former chief minister N. Chandrababu Naidu's attempts to fill the vacuum by taking up the cause of farmers with an eight-day-long fast have been overtaken by the developments over Telangana. Naidu was hoping that the fast, which helped him earn support from eight national and regional parties, will help him take the centrestage again and divert attention from Telangana. But the initiative taken by Congress MPs from Telangana with an indefinite hunger strike has brought the focus back on the emotive issue. Naidu, the longest serving chief minister of Andhra (1995-2004), plans to continue his efforts by organizing a massive public meeting on farmers' problems at Guntur Dec 30. However, with the Srikrishna committee on Telangana set to submit its report to the central government by Dec 31, Telangana is expected to dominate everything else. After YSR's death, Telangana Rashtra Samiti (TRS) chief K. Chandrasekhara Rao outsmarted Naidu by grabbing the opportunity and going on an indefinite fast for Telangana. Naidu, who hails from Rayalaseema, had backed the demand for Telangana in the 2009 elections but adopted a neutral stand after protests against the centre's Dec 9, 2009, announcement to initiate the process for formation of a Telangana state. Even Chief Minister N. Kiran Kumar Reddy seems to have no answer to the emerging situation. Kiran Kumar Reddy, who also comes from Rayalaseema, is opposed to the bifurcation of Andhra Pradesh. Though a leader picked up by the Congress leadership, Kiran Kumar Reddy may not get a free hand in tackling the pro-Telangana agitation, says Rama Brahmam, head of the department of political science in the University of Hyderabad. "After Dec 31, the Congress may say we need time to study the report of the Srikrishna committee. A decision may be delayed until the budget session of parliament gets over," he said. "Since the Congress can't take a risk by carving out Telangana, it may try to put the issue in cold storage. There are already many demands for separate states in various parts of the country," he pointed out. The Telangana issue may only add to the problems of the Congress in the state. The party is already shaken by the participation of over two dozen party legislators in the two-day hunger strike of Jaganmohan Reddy for farmers last week. Jagan, as the son of YSR is known, is set to launch his own party. As the Congress has only 156 legislators in the 294-member assembly, analysts say the government will collapse if two dozen legislators walks out with Jagan. Banking heavily on the political legacy of his father, Jagan is aspiring to fill the political vacuum but like Naidu and Kiran Kumar Reddy he too faces the Telangana obstacle. As the young leader comes from Rayalaseema and is focusing outside Telangana, he is also waiting for any decision on Telangana before making the next move. Political observers feel Jagan and his loyalists from Andhra and Rayalaseema may hasten the process of bringing down the government if New Delhi decides to carve out a separate Telangana state. 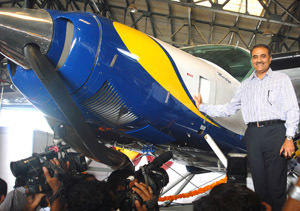 Minister for Civil Aviation Praful Patel at the launch of India’s first Sea Plane (amphibian plane) of Pawan Hans Helicopters, in Mumbai on December 27, 2010.